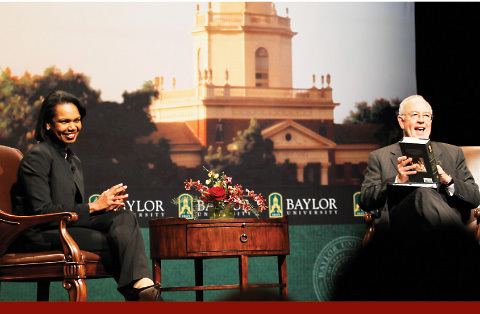 On November 9, 2011, President Ken Starr welcomed former U.S. Secretary of State Condoleezza Rice to the Waco Hall stage for On Topic, the president's series of compelling conversations on contemporary issues. 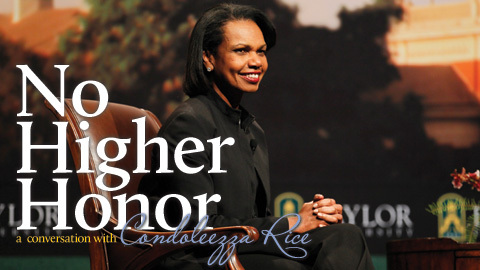 Dr. Rice, whose bestselling memoir, No Higher Honor, had just been released days before, shared with President Starr about her life and her public service in Washington. Starr: It all began in segregated Birmingham, Alabama. This great life journey into public service through the academy. Almost every American knows the Condoleezza Rice story -- a daughter of a Presbyterian minister, a church musician who has this great love for music and a serious vocational interest in music. A musician who has played with Yo-Yo Ma, and that's pretty serious. Share with us that journey, the professional journey from segregated Birmingham to public service in a very profound way. Rice: Well, thank you very much, but first I have to say thanks to you. Judge Starr and I have known each other for a very long time, and you have a wonderful president. I just met your wonderful provost tonight, and I want to congratulate you on the leadership of this great university. I want to say thanks for this warm welcome, and go Bears. I was indeed born in segregated Birmingham, Alabama, probably the most segregated big city in America. I have written a book about my parents, an early book called Extraordinary, Ordinary People, because my parents in many ways were ordinary people. My dad was a minister and high school guidance counselor, and also a football coach when I was born. My mom was a schoolteacher. It was a little bit unusual, because one of her first students was actually Willie Mays; she taught him English. I once asked him if he remembered my mom; he said, "Oh yes, I remember Miss Ray." (That was her maiden name.) "She used to say, 'Son, you're going to be a ballplayer. So if you need a little time out of class, you go right ahead and take it.'" Now that doesn't sound like my mother, but nonetheless, that was one of her first students, Willie Mays. So my parents were, in many ways, ordinary, but they were extraordinary in the way that they raised me. We were a family of faith. We believed deeply in God, so the church was very much the center of our lives. We believed in country, even though it was a country that in some ways, in segregated Alabama, rejected us as black people. But more than anything, faith and family came together in education in my family, because my folks always made us believe that you might not be able to control your circumstances, but you can control your response to your circumstances. And your armor in dealing with prejudice and segregation was education. Now, we came by it naturally, because our family had been educated for a couple of generations. And I just have to take a brief moment to tell you about one of the heroes of our family who was my grandfather on my father's side, John Wesley Rice Sr. Now, he was a sharecropper's son in Eutaw -- that would be E-U-T-A-W, I'm not kidding -- Alabama. And when he was a young man, he decided he was gonna get book learning in a college, so he asked how a colored man could go to college. They told him about little Stillman College, a Presbyterian school about 30 miles away. So he saved up his cotton and he went off to Stillman and went through one year. The second year they say, "So how are you going to pay for your second year?" He says he's out of cotton; they say he's out of luck. But he says, "How are those boys going to college?" They say, "Well, you see what they have is called a scholarship. And if you wanted to be a Presbyterian minister, then you could have a scholarship too." And my granddaddy said, "That is exactly what I had in mind." And my family has been college-educated -- and Presbyterian -- ever since. So this was a family that valued education, the transforming power of education. And in the segregated south, it was a way to say to a young kid like me that you may not be able to have a hamburger at the Woolworth's lunch counter, but if you work hard, if you're twice as good, you can be president of the United States if you want to be, and I became secretary of state instead. So I owe it all to my parents. Starr: 9/11 changed our history. The new century was ushered in. The age of terrorism was already before us, but it brought it home in an immediate and unprecedented way. And on 9/11, according to your wonderful description and poignant description, you had two presidential conversations, one with President Bush -- I think you may have even been giving orders to President Bush -- and then one with a president with whom you could converse in Russian, Vladimir Putin. Tell us about those two conversations on 9/11. Rice: Well, of course when 9/11 happened, and my assistant said that a plane had flown into the World Trade Center, I thought it had been an accident. And then a second plane, and I realized it had been a terrorist attack. I was trying to reach Don Rumsfeld on the phone, and I looked behind me on TV and saw a plane had hit the Pentagon. At that point, the Secret Service said, "You have to get to the bunker; planes are flying into buildings all over Washington." Now, the strange thing is that the president was at a four-hour, we thought, event in Florida. You remember he was at an education event. And so neither the deputy for National Security Affairs, Steve Hadley, nor I, went with him. It was just gonna be a brief trip. On that fateful day, he did not have his National Security team with him. So as I'm rushed off to the bunker by the Secret Service, I stopped to make two calls. I called my aunt and uncle. You have to know the Rices and Rays; they would have found their way to Washington, D.C., if they hadn't heard from me, so I thought I had better call them first. So I called them, and said, "I'm alright. Tell everybody, I'm alright." And then I talked to the president, who said, "I'm coming back." And I did something I'd never done before and I never did again; I raised my voice to the President of the United States and I said, "Stay where you are. It's not safe for you to come back here. We're under attack." I then made it down to the bunker, and my kind of Cold War/nuclear war training kicked in, because I was a specialist in Soviet military affairs in the early stage of my career, and I knew that we worried about something called a spiral of alerts. If our military increased its readiness level, the Russians would see it and they would increase theirs, and pretty soon you could get into a dangerous standoff. So I thought that I'd better call the Russians. I talked to President Putin, and I explained to him that we were raising our alert levels. He said, "I know. We're bringing our alert levels down; we're canceling our exercises. Is there anything else we can do?" And I thought, "The Cold War really is over." Starr: Very powerful. You said, and you wrote this on Page 79 of your book, that every day since has been Sept. 12. 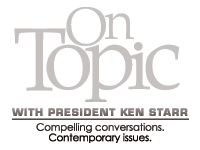 Starr: And you drove with the president on that day to the Pentagon. You began working 17-hour days; you were working hard before, but now remarkably hard. And then you write this: "When I woke up the next morning, which was the morning of Sept. 13, I turned on the TV. The scene was from London, and the Coldstream Guards were playing in the square outside Buckingham Palace. I realized that they were playing our national anthem. I broke down and cried." You'd had to control your emotions while the nation mourned, but you could let go that one time. Rice: That one time. Because in the immediate aftermath, all day on Sept. 11 and Sept. 12... We actually went to the Pentagon on Sept. 12, and I'll never forget driving up and seeing that smoldering hole in the building and the twisted metal, and rescue workers were still working there. These people were dead tired from having pulled people from the rubble; some alive, some not. And when I got back in the car at my house, I thought, "What is that smell?" It was actually the soot -- the smell of the soot from the Pentagon. And so I went to bed that night; I got up the next morning, and you're right, we'd just been going and going and going. Seeing the British play our national anthem, I thought, "It's good to have friends." And that was the first time that I broke down. We went on, on Sept. 15, to the national service at the National Cathedral, the day of mourning. At the beginning of that service, it was like being in a funeral, as you might imagine. And I can remember going up Massachusetts Avenue and the Russian Orthodox Church was tolling bells, and I saw one man standing on the side, and he had a sign that said, "God bless America; we will not be terrorized." And it gave me a certain strength that this ordinary American felt that way. So at the service, I can remember a moment when it turned, and it turned when the combined armed forces choir sang "The Battle Hymn of the Republic." Because for years, "The Battle Hymn of Republic," the Civil War hymn, had a phrase, "As He died to make men holy, let us die to make men free." And in our politically correct world, people had begun singing, "As he died to make men holy, let us live to make men free." And in honoring the dead, the chorus sang the original words. And all of a sudden, I felt in myself a sense of defiance; we were done with the mourning, it was time to protect the country. For years, "The Battle Hymn of Republic," the Civil War hymn, had a phrase, "As He died to make men holy, let us die to make men free." And in our politically correct world, people had begun singing, "As he died to make men holy, let us live to make men free." And in honoring the dead, the chorus sang the original words. And all of a sudden, I felt in myself a sense of defiance; we were done with the mourning, it was time to protect the country. Starr: Tell us about those first steps to protect the country. Rice: You know, we had not had an attack on the civilians on the homeland of the United States since the War of 1812. So we really didn't have any structures that dealt with internal security. I remember going into a room that you've been in many times, again, into the Cabinet Room at the White House. And all of a sudden, it wasn't just the secretary of state and defense and the chairman of the Joint Chiefs of Staff, it was the secretary of transportation, it was the secretary of energy -- all these people. And there were 50-some people in this room, and it was chaos. I thought, "I'm the national security advisor; I'm supposed to make sense of this for the president." But we had no earthly way to make sense of it. We didn't really have those structures. And so we had to improvise. We were in a different kind of war, and we knew it. We had to figure out how to turn law enforcement where we treated terrorists like criminals, on say "Law &amp; Order," where you preserved the evidence and so forth, to understanding that the most important thing that a captured terrorist can do for you is to tell you about the next plot. We had to change our thinking about how we were going to deal with terrorists. We had to change our thinking about protecting the country, so we created the Department of Homeland Security. But I'll tell you something. I am very grateful, and we were very fortunate, that there was not another attack on the territory of the United States, and there still has not been a successful attack. It's not because the terrorists don't try. Every day, they plot and they plan and they try. But it's because of the vigilance of our intelligence agencies, our homeland security people, and especially because we have men and women in uniform who volunteer, they volunteer, to defend us at the frontlines of freedom. And we owe them our eternal gratitude. Starr: Afghanistan... The Taliban fell quickly, and you wrote [on page 109] this in connection with the rebuilding of that war-torn country. "After 9/11, it was very clear that weak and failing states constituted a grave security threat to the United States. They could not control their borders and risked becoming safe havens for terrorists." And so a new model was developed, and you were at the vortex of developing that new model, not simply of military action but civilian action. Describe that. Rice: Well, imagine this. You're the national security advisor for the most powerful country in the world, and you've just watched an attack that brought down the Twin Towers, attacked the Pentagon, and saw the passengers of the flight in Pennsylvania driven to the ground, and you realize it's been done by a group of stateless terrorists, operating out of a failed state called Afghanistan, the fifth-poorest country in the world. And it's probably cost them $300,000 or so to launch the attack. And so your concept of physical security changes, and you recognize that actually the gravest threat to us is not from powerful marching armies any longer; it's from ungoverned spaces like Afghanistan, or Somalia, or the North-West Frontier between Pakistan and Afghanistan, where terrorists can breed and hide. But the worse circumstances are that they are either supported by state sponsors, in which case you have to hold the state sponsor accountable, as we did the Taliban in Afghanistan, or the population, because they're afraid of them, will just tolerate them. And because terrorists don't wear uniforms and they use civilians as human shields, you essentially have to somehow win the population to your side. That's the essence of what we call a counter insurgency strategy. Yes, you have to fight the terrorists, but you also have to make life better for the people there so that they are on your side, not on the side of the terrorists or tolerating the terrorists. And so that was the new model that was born. You had to bring, at night perhaps, security to a village, and then the next day, perhaps, help them with governance, and that afternoon, you're digging wells to help their lives be somewhat better. And that's what we finally really learned to do, the military and civilians working together. In fact, at the state department with the defense department, we created something called "provincial reconstruction teams," where under a brigade commander, you would have diplomats and reconstruction workers right there integrated with the military in these villages trying to help people be not just secure, but have better lives as well. Starr: Iraq... The president has made his announcement about the draw down and the withdrawal of all troops by the end of the year. Your reflections on the war itself, and then going forward. Rice: Well, we went into Iraq not to bring democracy to Iraq; that is a kind of erroneous impression out there. We went to Iraq because we believed there was a serious security threat from Saddam Hussein. This was, after all, a person who had dragged the region into war three times. President Clinton had actually used force against them in 1998. Hussein tried to assassinate George H.W. Bush. He used chemical weapons against his own people and against Iranians. He was shooting at our aircraft practically every day. I remember President Bush turning to Don Rumsfeld and saying, "What if he gets a lucky shot and brings down an American pilot? What are we going to do then?" And he put 400,000 of his own people in mass graves. We had intelligence reporting that he had reconstituted his biological and chemical weapons, and would reconstitute his nuclear weapons in a relatively short period of time, as little as a year, maybe by the end of the decade. It was a threat that we couldn't let stand in the shadow of 9/11, where we had let a threat materialize and it had come back to haunt us. Now, the weapons of mass destruction, that reporting turned out not to be right, but I will tell you that I'm very grateful that Saddam Hussein is gone, and that the Iraqis have a chance to build a decent democratic society there. They're stumbling forward, but young democracies always do. And I'm really glad, in light of what we read this morning in the newspapers about the Iranians and their progress on a nuclear program, that we're not sitting here talking about a nuclear arms race between Saddam Hussein's Iraq and Mahmoud Ahmadinejad's Iran. I think that's where we would be. So we did the right thing in taking down Saddam Hussein. Now, we would have hoped -- I would have hoped -- that we could keep a residual force in Iraq to help the Iraqis train their security forces, to help them with counterterrorism activities, and as a kind of counterweight to the Iranians, who are a meddlesome neighbor. We were able to get immunity clauses to protect American soldiers that were acceptable to us and to the Iraqis. I don't know what happened in the negotiations. But now that we have decided we're going to pull all of our forces out, I hope we double down on diplomatic support for the Iraqis. The Iraqis are about to become our ninth-largest purchaser of military equipment in the world, and the fourth-largest in the region. That will give us a chance, through military training exchanges and the like, to have a close military relationship with the Iraqis. Because an Iraq that is a friend of the United States, and that won't invade its neighbors, and that won't seek weapons of mass destruction, is going to be at the center of a very different kind of Middle East. And so I, more than anybody, mourn and regret the loss of life, the sacrifices that we encountered in Iraq. But I think in the long run, it will turn out to be a decision that leads to a much better Middle East. Starr: Let's move to Africa. The president had a great heart for Mexico and Latin America, but less time to spend on those issues than he had intended and prepared. That first foreign trip was to Mexico. And you write this: "In a speech in Senegal, President Bush put it this way, 'The stolen sons and daughters of Africa helped to awaken the conscience of America.'" And then the Millennium Challenge Account was launched. Bono comes on stage and becomes a partner in the effort, the global fund to fight HIV/AIDS. And you write this on Page 228: "The president began a speech by saying that the United States had been blessed with plenty. He went on to quote the Gospel of Luke, saying, 'Everyone to whom much is given, much will be required.'" And you write this: "These initiatives will be remembered as one of the greatest acts of compassion by any country in history." Rice: Africa is the continent where people always say there's great potential. And I think President Bush not only believed that there was great potential, but that it was about time for it to be realized. And the AIDS pandemic, which when we came into office, the predictions were that another 10 million people would die during our term in office. President Bush, a man of compassion, just couldn't fathom that. So we had a chance -- not to cure AIDS, because there's still no cure -- but to use antiretrovirals that had begun to extend life. And so we launched the President's Emergency Plan for AIDS Relief to make antiretrovirals available to as much as the population in the hardest-hit countries as possible. And it's one of those moments that I will always remember. I remember sitting in the Oval Office, having the discussion about whether to do it. And of course, the budget people were saying, "Uh, 15 billion dollars. That's a lot of money." And people were saying, "Well, will the Africans use the money well?" And one of the things that the Millennium Challenge did is, it really only gave money to countries that were fighting corruption and governing wisely and were more democratic. But this AIDS relief was not going to be conditioned in that way; it was just going to go to the countries that were hardest hit. And we had the discussion, and a question came up, "Well, if you can't cure the disease, is it worth it to extend life?" And that was something I felt I could speak to because my mother had cancer, breast cancer, when I was 15 years old. That was her first diagnosis. She lived 15 years longer, and she died when I was 30. And even though I miss her every day, I was so grateful to God that she saw me grow from 15 to 30. She saw me become a Stanford professor. She knew that I was launched, and not her 15-year-old girl; her 30-year-old professional daughter. And so I spoke up and I told that story. And I said, "You know, Mr. President, we may not be able to cure those moms, but they will live longer to see their children get older, and that will matter." And at the end of the discussion, Mike Gerson, the president's speechwriter and confidant, said, "If we can do this, and we don't, history will treat us with shame." That was the nature of that discussion in the Oval Office. It was a deeply philosophical, compassionate discussion, not the facts and figures. I'm very proud of what the president did in launching that program, and, indeed, millions of people have been saved as a result. I will never forget going to Uganda and hearing a group of AIDS orphans, the oldest one probably no more than 16 or 17, singing "America the Beautiful." Starr: Another story. You described a remarkable funeral of one of the great men on the planet, John Paul. And you described the sun bursting through the clouds suddenly, and you write this: "Perhaps only believers saw this powerful affirmation of the truth of the resurrection." And you had an exchange with Laura Bush, the first lady: "I was grateful to have been there," this is on Page 353. Describe that almost miraculous scene. Rice: Well, we were at the funeral for the Holy Father, and it had been a kind of cold and gray day, and it was a High Mass, so it was a three-hour mass. And at the end of it, I walked to the front to get with the president and Laura; President Clinton was with us, President George H.W. Bush was with us, and we were all standing there. And as the funeral mass ended, the pallbearers lifted the coffin and started back up the stairs of St. Peter's Basilica. The bells were tolling from the Basilica; the crowd, a million strong, was waving solidarity banners because, of course, Pope John Paul II was Polish and had consecrated the Soviet Union to God, and many believe helped to bring it down. The choir was signing this ethereal music. And all of a sudden, the pallbearers turned the coffin towards the crowd, and the sun burst out. I was speechless. Laura said, "Did you see that?" And I said, "Yes," but I couldn't really speak. And as we walked back past the Pieta, I said to myself, "Thank God for the gift of eternal life." Because it was the most powerful demonstration of the fact of the resurrection that I'd ever seen. I asked many people afterwards if the press had reported on this, and they said no, it had not been reported. But I was in Argentina a few weeks later, and the Argentine foreign minister, a Catholic, said to me, "Did you see that?" And I wondered, maybe it was something only believers saw, but it was really pretty powerful. Audience members were invited to submit written questions which were moderated by Baylor's executive vice president and provost, Dr. Elizabeth Davis: Dr. Rice, I'm worried you might not answer this first question, but it was so good, I'm hoping you'll try. The question: "How did you become so special, awesome and famous? P.S. I am eight years old. (Signed,) Langston Wade." Rice: Well, thank you very much, Langston, for your question. You have to find something that you love to do, and I am very fortunate that I found what I was passionate about, even though I thought what I was passionate about was that I was going to be a concert pianist. I had studied music from the age of 3; I could read music before I could read. And I went off in the summer of my sophomore year to the Aspen Music Festival School, where a lot of prodigies studied. And I met 13 year olds who could play from sight everything that had taken me all year to learn; I was 17. And I thought, "I'm about to end up teaching 13 years olds to murder Beethoven or maybe playing at Nordstrom's, but I am not going to play at Carnegie Hall." And so, Langston, I decided to look for another major. I took a course in international politics; it was taught by a Soviet specialist, and I loved it. And that's how I got interested in international politics. Once I found what I loved to do, my passion, I felt that I wanted to get good at it. So I learned to speak Russian, and I worked very hard. And then I found people who helped me along the way. Everybody has to find people who help them along the way; we call them mentors. It might be your teacher, it might be your minister, it might be a community leader, maybe somebody at the Boys and Girls Clubs, but somebody who will take an interest in you, and I always was lucky to find people who took an interest in me. So that's why I'm blessed to be doing the things that I'm doing now, but it all started with finding something that I absolutely loved to do. So to you college students out there, and I know Langston is gonna be one pretty soon -- I can already tell that -- but to you college students out there, I just say one thing. When my students ask me, "How do I become like you?" -- in other words, "How do I become secretary of state?" -- I say, "You start as a failed piano major. Don't plan every step of your life. Life takes funny turns." Davis: "With all of the revolutions that have occurred in the Middle East during the Arab spring, what do you think the United States' role will be among the new governments of these countries?" Rice: Well, the Arab spring is one of the most extraordinary developments in several decades. We have to remember that authoritarianism just isn't stable. People ultimately will take their freedom if you don't give it to them. Now, because reform has come late in the Middle East, it's a very chaotic situation. The fact is, these people have gotten their freedom, but freedom and democracy are not the same thing. Democracy is the institutionalization of freedom. And if you are going to have a situation in which the weak are not exploited by the strong, where you don't have a tyranny in the majority, where the rights of women are protected, where the rights of religious minorities are protected, we're going to have to help them get from freedom to democratic intuitions. We're going to have to help them write constitutions. We're going to have to help them train civil society. And we are going to advocate for the proposition that freedom and democracy cannot be a license to overrun the rights of those who are minorities. In that sense, religious minorities are particularly at risk. You've seen probably some of the things that have been happening to the Coptic Christians in Egypt. This is going to be a long haul, but, ultimately, I think we're better off without authoritarians there. And while it might be a little rocky, in the long run, I think it will ultimately be more stable. Davis: You provided part of an answer to this question when you responded to Langston, but I wonder if you might add a little more for our college crowd. "What choice or decision that you made in college had the greatest impact on your life and career?" Rice: Well, clearly, it was the decision to leave music. And you have to understand; I was bred to be a musician. Condoleezza comes from "con dolcezza," which is a musical term for "with sweetness." So my mother had a view. I got my first piano when I was three months old, so it was clear where I was going. And indeed, when I was 10 years old, having played already for seven years, I told my mother, "I'm quitting." And she said, "You're not old enough or good enough to make that decision." And so I continued to play. She was not into modern parenting, obviously. So when I made the decision to leave music, it was really a huge decision. And I felt, for the time that I was sort of searching for a major, that I was a failure. I can remember going back to college, and in the first quarter when I was back thinking, okay, English literature; that's what I'll study. With all due respect to English literature, I hated it. Then the second quarter, I was going to do state and local government. That sounded practical. My project was to interview the city water manager in Denver -- the single most boring man that I have ever met to this day. And I thought, "That's not it either." Then, as I said, I took that course in international politics, and that was it. So to the students, I would say, if you have not yet found what you're passionate about, keep looking, number one. Secondly, if you're looking for it, you may feel that you're not ever going to find it, but it may find you, as international politics found me. Third, when you finally find it, go for it. And don't be deterred by those who might say, "You want to study what?" Because the idea that a black woman from Birmingham, Alabama, ought to be a Soviet specialist is pretty farfetched, right? Just because you look a particular way or you are a particular gender, don't let anybody define your passion for you on that basis. And the final point I made to Langston, find somebody who's interested in your career. We have a strange idea that your role model has to look like you. Now, if I had been waiting for a black, woman, Soviet-specialist role model, I'd still be waiting. My role models, and actually my mentors were white men; in fact, old white men, because those were the people who were in my field. So just find somebody who is interested in you. It doesn't matter what they look like.